San Marco is the name of a religious complex in Florence, Italy. It comprises a church and a convent. The convent, which is now a museum, has three claims to fame. During the 15th century it was home to two famous Dominicans, the painter Fra Angelico and the preacher Girolamo Savonarola. 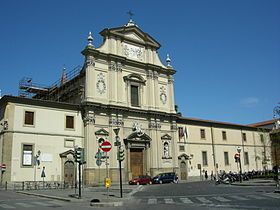 Also housed at the convent is a famous collection of manuscripts in a library built by Michelozzo. This article uses material from the Wikipedia article "San Marco, Florence", which is released under the Creative Commons Attribution-Share-Alike 3.0 License.